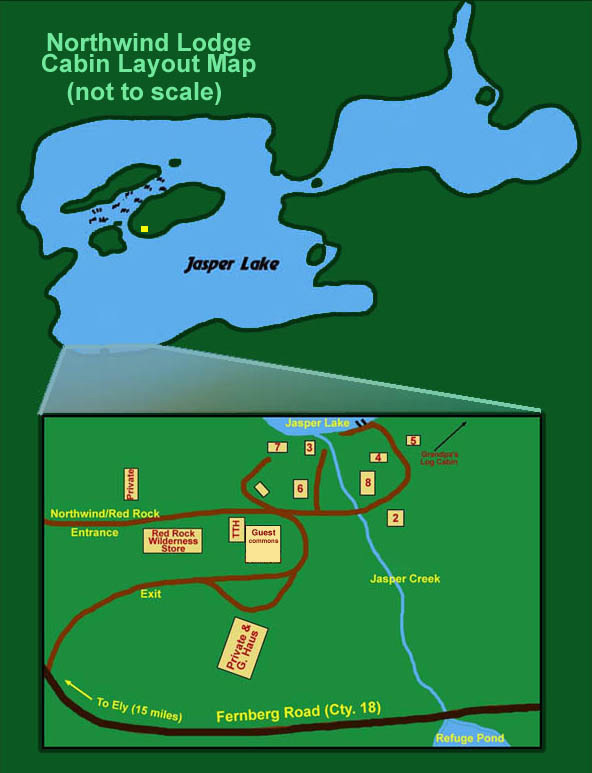 Jasper Lake is a 195 acre lake. Northwind Lodge is the only resort on the lake and there are a few private residences. Northwind Lodge appeals to families and vacationers seeking a calmer, smaller lake with opportunities for quiet fishing, kayaking, canoeing and other low-key activities. It’s a great place to get away from city-life and into the wilderness. Activities such as waterskiing and jet skiing are not allowed from within Northwind Lodge and are also generally not pursued by the other residents on Jasper Lake. It’s a small, clean, beautiful lake outside of the BWCAW. It has been home to the Baltich’s of Northwind Lodge since 1939. This cabin-layout map is roughly where the cabins are located in relation to each other at Northwind Lodge. We are a heavily wooded resort with trees and brush separating all cabins. As you can see, they are somewhat scattered about and all offer privacy. Red Rock Wilderness Store is right on the lodge grounds and is a short walking distance away from most of the cabins, yet far enough away so that the resort remains a private place for our guests.